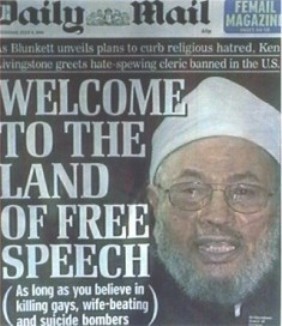 As can be seen our present Lord Mayor of London, Ken Livingstone, believes 'freedom of speech' is part of this country's inheritance and people from all over the world should be invited here to air their views 'very noble of Ken' even if these people probably disagree with abortion but then advocate the use of children as suicide bombers. I don't really get the point that if somebody is against abortion yet when a foetus grows into a child they will strap a bomb to it so not only will it then kill itself but others with it. That needs explaining to me. Let us look back in time some 725 years, or so, during the reign of Richard II, when a distant predecessor of Ken Livingstone, William Walworth was Lord Mayor of London. Wat Tyler led the 'Peasants Revolt' into London and confronted King Richard at Smithfield on 15 June 1381 when during negotiations a scuffle broke out and William Walworth mortally wounded Wat Tyler and later that day William Walworth returned and beheaded Wat Tyler. So much for 'freedom of speech' in England during the 14th centary. It would appear we have come a long way in England in the past 700 years, or have we? We invite foreign nationals to come here and speak publicly to encourage British citizens to follow in their beliefs yet on the other hand we have the English Law Society trying to stop the freedom of complainants showing the world how they (Law Society) run a corrupt 'Lawyers Protection Racket'. Before we give rights to people like Yusuf Al-Qaradawi, who is banned from 'the good Ol' USofA', we should look at the rights of our own citizens especially when you get Lord 'Chuckling Charlie' Falconer talking plenty but doing nothing. Let me expand on the 'English Law Society's' gagging attempts. We have Richard Hegarty, Chair of the Law Society's Compliance Board who we will now refer to as 'Dickie the Chair' who instructed Willoughby & Partners in London E14 9SG with a view to taking action against my hosting company. 'Dickie the Chair' rang me on the 6 Nov '03 trying to intimidate me with the comments I have put on this web site and according to Aman Virk, Manager, Quality & Service Standards at the Office for the Supervision of Solicitors also Richard Thomas, the Information Commissioner, they both say 'Dickie the Chair' was acting on "Law Society business", what does this tell us? Well as 'Dickie the Chair' is acting with the approval of the members of the Law Society Board let me name some of them; Chief Executive of the Law Society (who replied to me on behalf of Peter Williamson) Janet Paraskeva; The President of the Law Society (who I have previously written to) Peter Williamson; Vice President Edward Nally; Deputy Vice President (who told me 'Dickie' "hadn't disappeared") Kevin Martin; July 2004 it's that time when the 'President' line all shove up one. I wonder if that includes 'Dickie the Chair'. As can be seen 'Freedom of Speech' when against the English Law Society is something that is hard to achieve, but then again with 'Ken' our Lord Mayor of London championing the cause, may be its time to send him a letter or an e-mail. The Law Society's view "bring back 'William Walworth'"
'Chuckling Charlie' Lord Falconer said: "Freedom of speech is alive and well in this country. We are a country which could not be freer in its press, in what we say. 'Chuckling Charlie' Falconer: "Well, you describe that as depriving this country of freedom of speech which is hugely overdone". Humphrys: "Doesn't matter, she's got a criminal charge. She was not allowed to do something which Tony Blair himself has defended in the past. ..."
'Chuckling Charlie' "Well I don't know anything about that. ..."
Mr Clarke told BBC Radio 4's Today programme that there were places people could go to air their views, like Speakers' Corner in Hyde Park, and through the newspapers. Translation: Sod off out of my sight and earshot. "Lordly heights for Blair's friend" ...is probably the ultimate example of a "Tony's crony".